Ever wondered what goes behind the scenes in concocting a webpage that you love in WordPress? Elementor is a page building platform that makes page building as easy as it gets. It is the best alternative for Visual Composer and this plugin is free to use. Although Elementor is a vast community engulfing a multitude of templates, subset plugins, and features; today, we are specifically going to discuss this incredible new feature known as Shape Divider. You want to transform your web pages and create attractively alluring websites on WordPress? Transform your designs and notions to reality with none other than the Shape Divider. What is Shape Divider and How it Helps? Indubitably Elementor is one of the best web page building plugins on the market. What we love about the Elementor page builder plugin is its thriving community which is not only collaborative but stays consistently involved in getting their feet wet in new things all the time. 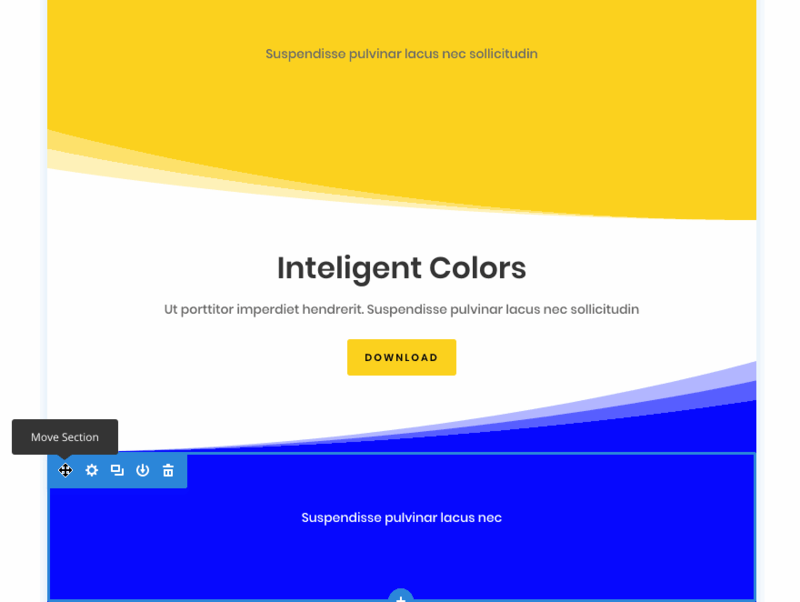 A page builder particularly fueled by an ideology to push design trends forward sets the right tone to broaden up every possibility, and nothing serves the purpose better than Elementor. With Shape Divider, it enables WordPressers to create awe-striking separator effects and lend an air of pride to your digital products. What’s Unique about the New Shape Divider Feature in the Elementor Page Builder? Elementor Shape Divider allows users to add cool shapes to the top and bottom of each website fold. It not only creates an attractive look and feels for the section background, but it also empowers customers to navigate their way through the website seamlessly. Starting off with 18 different shapes, the Elementor Shape Divider feature can customize any web page and fashion endless versatile options for just about any site. How Exactly Does the Magic Happen? We can’t help but wonder, how do design experts at Elementor make the magic happen? Let’s give you a brief insight. The Shape Divider feature leverages highly optimized SVG shapes which are custom designed and manipulated to perfection. While designing the top and bottom separators, the intent was to create them as lightweight and optimized as possible, so that it becomes possible to deliver high-resolution results on just about any other website. Each Shape Divider is asynchronous. It means they only load when you need them to load. The transition effects have no significant impact on the page load speed altogether. First things first, how do we get access to Shape Divider on our Elementor Web Page Builder. For that, we need a WordPress website pre-installed with Elementor. Now, while designing a page, select the Section you wish to customize with an SVG shape. Select Style tab in the Settings Panel which is usually located on the left-hand side; now, scroll down to the Shape Divider section and choose top or bottom. Select a Type from the dropdown list. Once you are done with the selection, you can now set other attributes such as Height, etc. You can also customize the selection to Flip, Invert, Move Behind or Bring Upfront. It allows you to Add Shapes to both sides of the section; top and bottom. You can customize the shapes differently for each side as well. 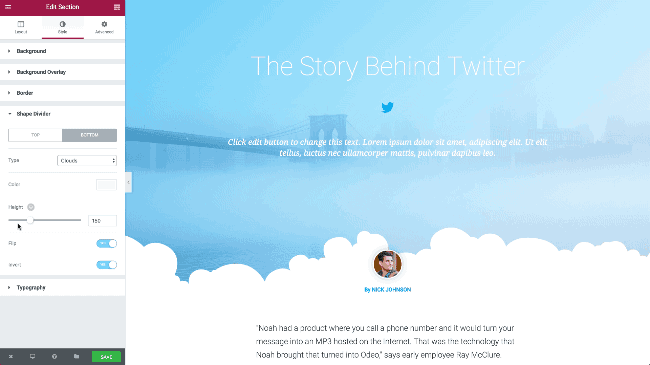 For instance, you can use the wave for at the bottom and the cloud form at the top or vice versa. You can control the size of the shapes using the fingertip control access. The best part is that you can easily invert and flip the images as per your liking. 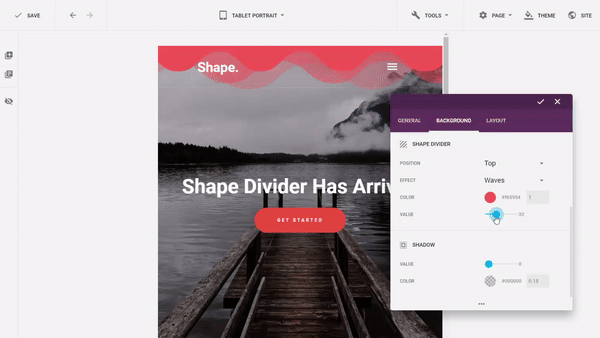 Shape Divider also introduces a mobile-friendly editing tool to make shape dividers on website optimized to fit any desktop, laptop or mobile screen. You can make those changes using the Mobile Editing feature in Elementor. The Elementor community is always on their heels to make a difference for their loyal customers. Hence, they are always looking forward to creating better opportunities for them. By introducing 4 stunning templates which are FREE, they highlight creative ideas on how one can exploit different shapes. If you are a Pro user, you get 2 additional shape templates that are quite an attraction. Not interested in getting your head stuck in coding hassles? The Elementor Page Builder can take those worries off your shoulder. With the Elementor Shape Divider feature, you can now customize each section of your website pages with just a few clicks. 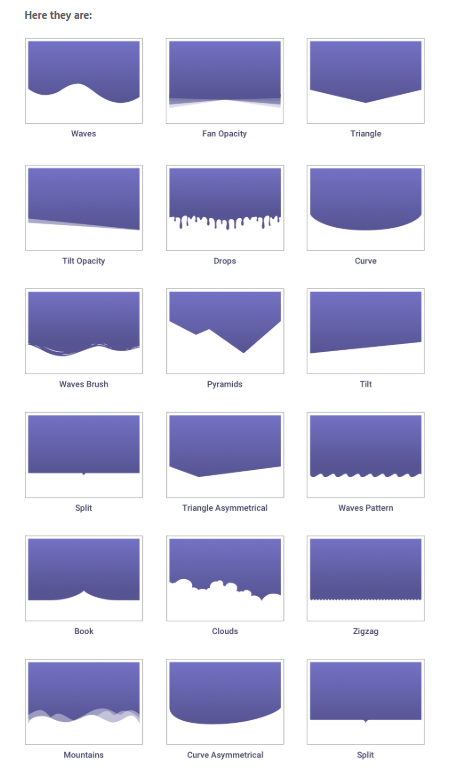 Amazingly, you get 18 different shapes to create Page Sections as well! Woohoo… All thanks to the Page Divider plugin. So, incorporate Style & Interest in all your web pages and customize them in any way that you want. Shape Divider is one amazing tool that you can’t ever have enough of.